Bonney, A., Phillipson, L., Jones, S. C. & Iverson, D. (2009). 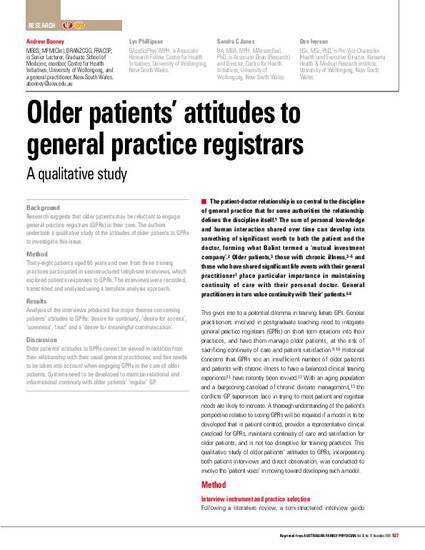 Older patients' attitudes to general practice registrars: a qualitative study. Australian Family Physician, 38 (11), 927-931. Background Research suggests that older patients may be reluctant to engage general practice registrars (GPRs) in their care. The authors undertook a qualitative study of the attitudes of older patients to GPRs to investigate this issue. Method Thirty-eight patients aged 60 years and over from three training practices participated in semistructured telephone interviews, which explored patients responses to GPRs. The interviews were recorded, transcribed and analysed using a template analysis approach. Results Analysis of the interviews produced five major themes concerning patient attitudes to GPRs: desire for continuity, desire for access, openness, trust and a desire for meaningful communication. Discussion Older patients attitudes to GPRs cannot be viewed in isolation from their relationship with their usual general practitioner, and this needs to be taken into account when engaging GPRs in the care of older patients. Systems need to be developed to maintain relational and informational continuity with older patients' regular GPs.